In 11x7-inch glass or plastic container, arrange shrimp in single layer. In 1-quart saucepan, heat soy sauce to boiling over high heat. Stir in gingerroot; reduce heat to medium. Simmer uncovered about 5 minutes or until liquid is reduced by half. Stir in vinegar, sugar, sake and salt; pour over shrimp. Cover; refrigerate 2 to 3 hours. Remove shrimp from marinade with slotted spoon; arrange on serving plate. Discard marinade. Sprinkle onions over shrimp. 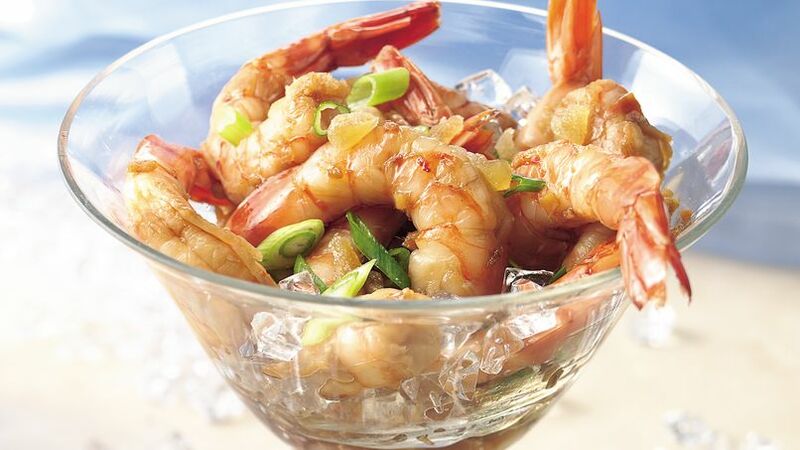 Serve shrimp with toothpicks. Because these shrimp will be eaten with the fingers, purchase shrimp with the tails on for a prettier look. Provide a small bowl for the tails. This shrimp is perfect to bring to a party. You can remove it from the marinade and place in a shallow bowl. Cover with plastic wrap to tote to the gathering.